Bless me Father, for I have sinned. It has been 5 days since my last blog post. I have been a bad, bad (wannabe, struggling, frustrated, you name it) writer. A very bad writer indeed. I can barely bring myself to say it, but I have committed a cardinal sin. Fed up of form rejections (‘thanks, but we’ll have to take a pass’) I took action. Naive, foolhardy and sinful action. I had the temerity and sheer gall to reply to a form rejection and kindly request a word or two of feedback. It’s something I’ve never done before and will probably never do again. Rejection is part and parcel of the game; you take it on the chin and move on. Simple. For some reason, that particular rejection caught me on a bad day, the disappointment hit a little too hard and I typed out a reply (a polite reply, of course) and hit the Send button before giving myself a chance to think. Naturally, immediate regret and intense shame followed. I waited, cringing in a quiet corner, for the seriously hacked-off reply. What I actually got was some of the most detailed, helpful and encouraging feedback I could possibly hope for. My sad little story was a ‘regretful reject’ by all accounts. This from a pro-paying market too. It pretty much made my day. A rejection of course, is still a rejection and I hereby promise never to sin again. That delightfully brackish tang in the air? Ah… the sweet smell of failure. 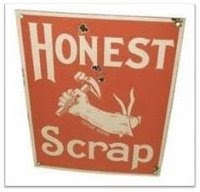 The always wonderful Rebecca Nazar has been kind enough to bestow upon me the Honest Scrap Award. It seems she thinks I’m something of an enigma and it’s her way of demanding some honesty. Is that good or bad? I still can’t decide. She asked nicely though, so here goes. This award is bestowed upon a fellow blogger whose blog content or design is, in the giver’s opinion, brilliant. 2. Choose a minimum of 5 blogs that you find brilliant in content or design. Or improvise by including bloggers who have no idea who you are because you don’t have five friends. Show the five random victims’ names and links and leave a harassing comment informing them that they were prized with Honest Weblog. Well, there’s no prize, but they can keep the nifty icon. As I’m still pretty new to the world of blogging, I’m going to bend the rules a little and pass the honour on to just two poor, unfortunate souls who have been nice enough to comment on one of my stories out there in the land of the web. Inkpot – otherwise known as Iseult Murphy. She has a dark mind and I like that. She’s also a member of the Horror Writers Association and that is very cool. Michael Stone - A great writer, ask anyone. 1. When I was a kid there was no doubt in my mind that I’d be a writer when I grew up. No doubt at all; it was fact, pure and simple. 2. I’m obviously still waiting to grow up. 3. I used to think that tall, thin (I mean really tall, really thin) people lived in street lights and turned them on and off every day. What they did the rest of the time was something I never really worked out. 4. I once saw Humpty Dumpty on the roof of my neighbour’s house, sitting there plain as day with a huge grin on his face. I waved, and he waved back (Humpty that is, not the neighbour). Fact. 5. My dad died when I was twelve years old and I can still remember every single detail of that day. 6. When I was fifteen I had a long list of potential pen-names and I practiced a signature for every last one. L.R. Bonehill wasn’t among them. 7. I had a summer job in an undertaker’s. One of the first dead bodies I saw was a forty-something man who had died alone at home and had gone undiscovered for around three or four months. The sight and smell was... well, not very pleasant to say the least. 8. I spent around three weeks sleeping rough on a rail tour of Europe and was routinely kicked out of many a train station for sleeping on a bench or tucking myself away in a nice, comfy alcove. Never, ever again. 9. I’m a Sinatra nut. 10. Without fail, my children go to the bathroom at the same time. They stand either side of the toilet and pay not a jot of attention to what they’re doing. Is this normal? It’s a sad day today, a sad day indeed. I’ve just found out that the Well Told Tales pulp podcast has permanently closed its doors. And that’s a hell of a shame. For my money, podcasts are a great format and without doubt an important part of the future of short fiction. Not only are they a great potential market for those of us trying to carve out a niche (however small) as storytellers, but they can bring a whole new level of insight or drama to a story that a print or web zine simply can’t offer. While we may not have time to read as much as we’d all like, it’s generally easy to jack-in to a fiction podcast and let it take you to a strange new world… and keep working or whatever else it is we need to do in this hectic world. Well Told Tales was up there with the best and it’s a great shame that it’s no more. Hopefully, there will be something else to come from the good people behind it sometime soon.